Damn Good Dinners – Damn, I Can Make That! Guys, I wish I could say we were busy whipping up a million new recipes for you which is why we haven’t posted the entire month of July. But actually, it’s a little more exciting. One of our very own got engaged! Congrats, Sonia! So, as you can imagine, we’ve had some other things on our brains. But, we’re ready to jump back into it. We missed you guys! With all that’s going on now, we’re going to keep it super simple. Like toss-it-all-in-a-processor simple. We’re well into grilling season and I’m not gonna lie – there’s only so many ways you can grill chopped veggies before they get boring. I mean, we love you spicy veggies, but we need a change. Enter: grilled romaine. But not just plain romaine, romaine with tahini dressing. Not only does the romaine give you a smokey taste, but the tahini gives it an extra nutty and savory kick. 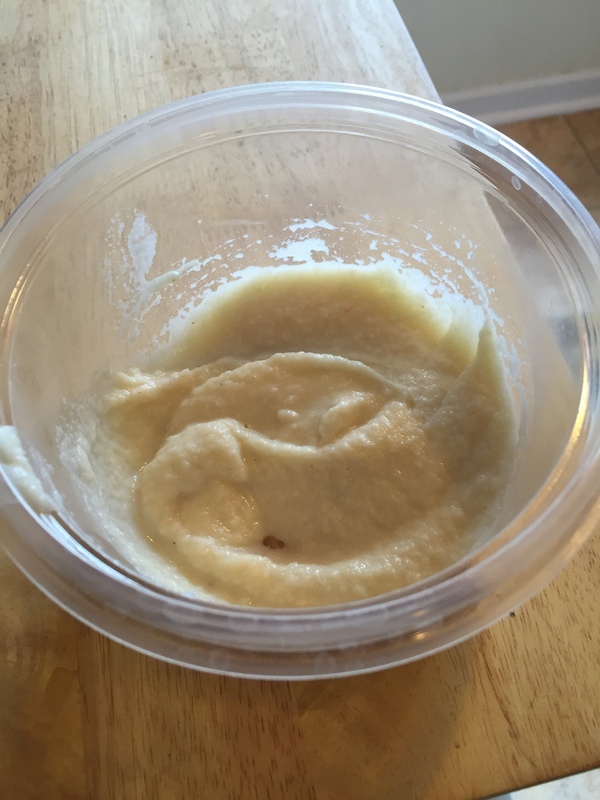 In a food processor (or by hand), toss in the tahini, garlic, and lemon juice. Pulse all of the ingredients together until smooth and creamy. If you notice it’s getting too thick, add in more oil and a slight bit of water. It should have the consistency of a creamy dressing when you’re done. For the romaine, clean and separate the leaves. Grease the grill and bring to medium heat. Place the leaves on the grill (over a tiny flame is a-ok), and let them crisp for 2-3 minutes. Just the edges of the leaves should brown. 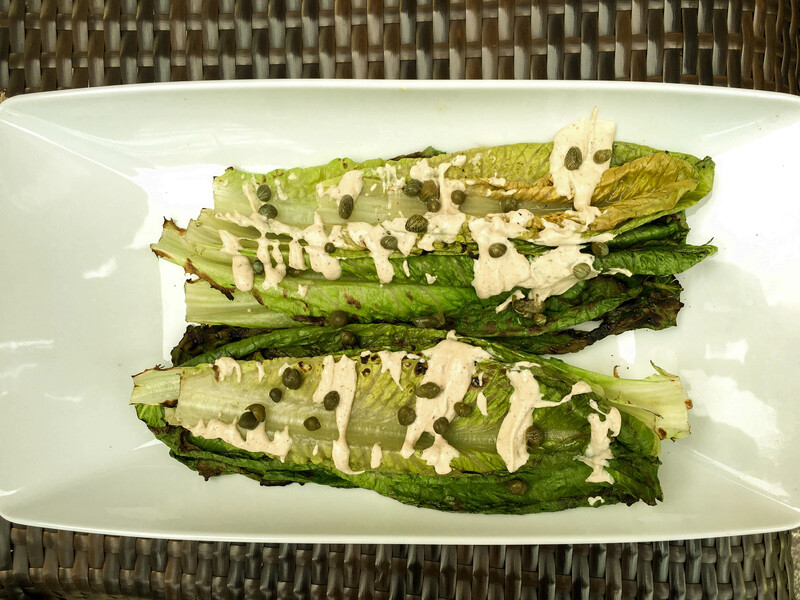 When serving, pour the tahini dressing over the romaine and top with capers. I’m so sick of the typical red sauce in pasta dishes. Legit I get acidity these days from eating too many tomato based sauces so I figured I would try and mix it up in case anyone else out there is just as over it as me. I wanted to do an alfredo like sauce but hopefully keep it figure friendly as well. Luckily there are so many skinny variations out there in the world wide web and I found this yummy cauliflower based one! I legit roast cauliflower on the reg and even make the Indian sabzi version of it all the time so now thatI can utilize it in one more way is #winning in itself. Anyway, next carb craving try this sauce over marinara and don’t tell me if your pasta doesn’t sing! 1/2 tsp of salt (I added a pinch of black pep too). Cut the onion & garlic into thin slices and sauté in butter for about 20 minutes or until caramelized. 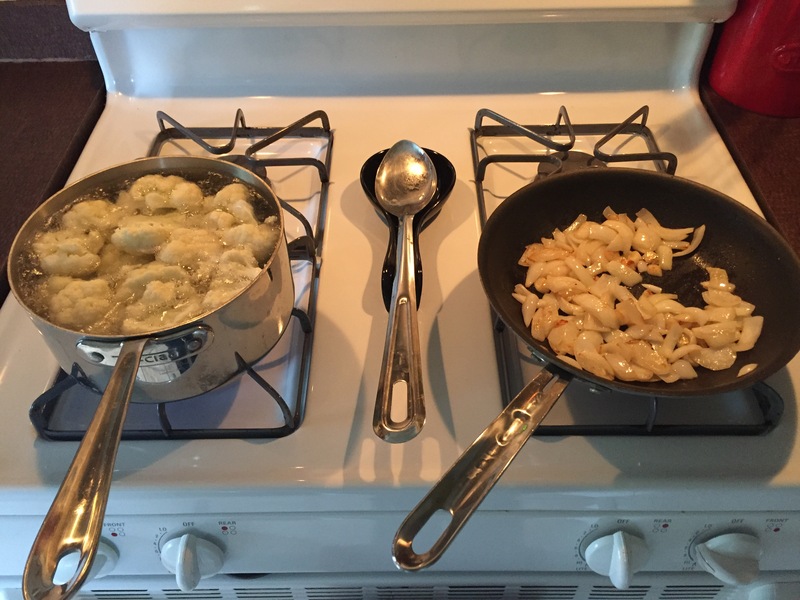 Boil the cut up cauliflower florets until tender in the broth (Save a 1/2 to 3/4 cup for the sauce) . Combine milk, broth, cauliflower, and veggies and blend until smooth. I added a tbsp. of grated pecorino romano because sauce should have cheese IMO. FYI makes about 3 cups of sauce. Tip: If sauce is too thick, loosen with broth when reheating. In the Poconos, recently my friends and I were on a wine tour doing tastings of the area vineyards and as we all know when drinking copious amounts of booze causes most people to binge eat. Luckily, there was a cook-off contest going on nearby so we stumbled over and tried all the eats the locals had made. There was a plethora of good food like sausage and peppers, mushroom risotto, etc. but this beef dish just knocked my socks off! I asked for the recipe because I wanted to recreate it for the blog, but more importantly, I wanted to try it sober to see if I even liked it (who knows when your inebriated, errythang tastes good under the influence). My God. I was NOT disappointed! It was just as yum, so I hope you enjoy this as well. In a medium saucepan cook soy sauce, honey, pineapple, cranberry juice into a marinade. Add cranberries and candied ginger cook for a bit more before turning off stove to cool. In the meantime, coat steak with the ginger and garlic, then pour cooled marinade over steak. 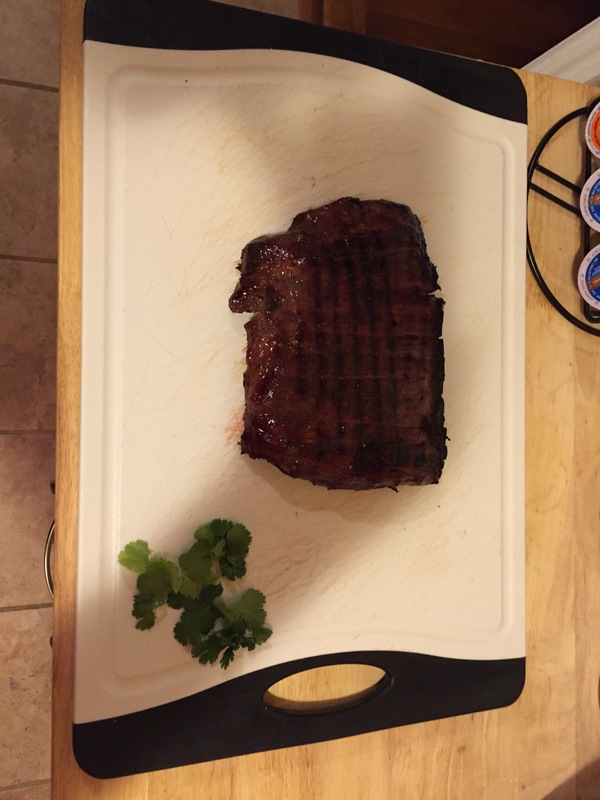 Marinade for 1-2 hrs then remove steak from marinade and cook for 7-10 minutes on each side. Take the marinade and recook to turn into a glaze for the steak. After letting meat rest slice on grain. Drizzle remaining cooked marinade then serve w bean sprouts and chopped cilantro. Mahi-mahi is such a yummy fish taco fish but I don’t know how else to prepare it other than blacken it. That’s when I went on a quest to find a different, yet easy, way to prepare it. 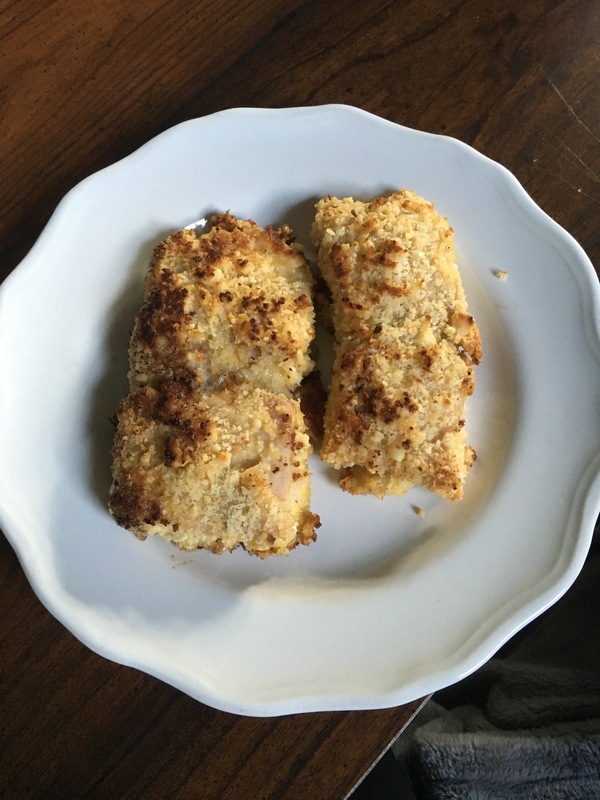 Maj other benefit of this recipe is that it’s crazy high in protein because of the nutty crust (and obvi the fish itself). Preheat oven to 450 degrees. In the food processor chop the nuts until it’s the sam consistency as the breadcrumbs, mix the nuts & breadcrumbs. Whisk together the milk & egg. S&P the fish before coating in egg mixture and coat both sides with the nut panko mix. In a skillet with hot oil (medium to high heat) Sear the fish on both sides for about 3 minutes each before placing in oven for 10 minutes (or until firm/cooked).